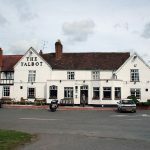 Run by the Clift family for over twenty six years, The Talbot is managed by Annie. There is a strong emphasis on organic and locally produced ingredients, (with the exception of fish delivered from Cornwall and Wales) and traditional, seasonal and sometimes ancient recipes,all re-worked with an imaginative flair and real emphasis on wholesome flavour. In a peaceful setting on the River Teme in Worcestershire, we are easily reached by road and rail and we are an hour’s drive from Birmingham International Airport. With well-appointed en-suite bedrooms, we offer a superb base for exploring the area. The Talbot is a 15th Century building and all of the bedrooms are on the first floor. There is no wheelchair access to them. There are two staircases, one to the old wing and one to the new wing, both are fairly steep but there are handrails. In some of our bedrooms there is a step up into the bathroom and all showers have built in shower trays. Access to the ground floor for wheelchair users is by ramp (over one small step) to the reception door, from there the whole of the ground floor is level including The Gold Room Restaurant which opens out of the lounge bar. The only exception is The Blue Room Restaurant which is one step up from the lounge bar. There is a loo with wheelchair access on the ground floor.